Fresh peaches are called for in this recipe, but fresh ripe nectarines or drained canned peaches will work as well. Serve this super easy cobbler warm with a scoop of vanilla ice cream or drizzle with some plain heavy cream. 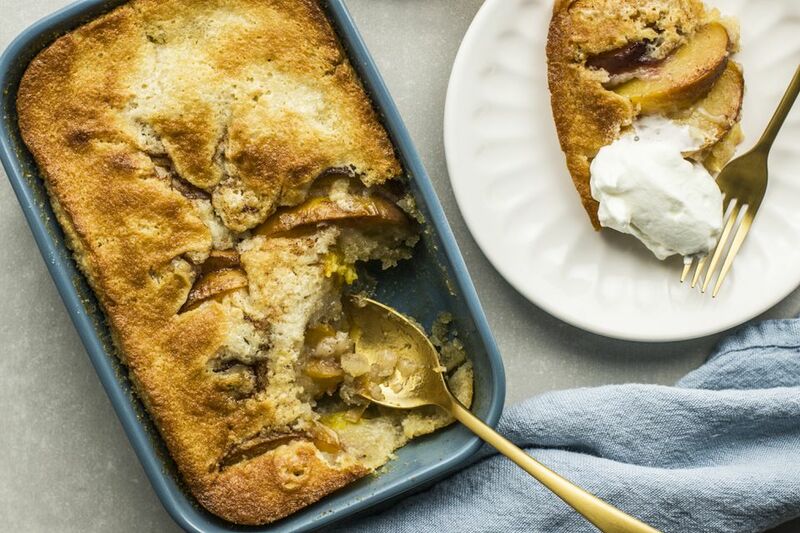 As the cobbler bakes, the cake-like batter partially covers the cinnamon-spiced peaches. It's a fabulous summer recipe, perfect for a cookout or Fourth of July celebration. Enjoy it any time of the year! Heat oven to 375 F (190 C/Gas 5). Pour melted butter into a 2-quart baking dish (11-by-7-inch or 9-inch square). In a mixing bowl, combine 1 cup of the sugar, the flour, baking powder, and salt; stir to blend. Stir in the milk and vanilla until blended. Bake for 40 to 50 minutes, or until a toothpick inserted into the cake comes out clean. The top will be browned and the cake will begin to pull away from the sides of the pan. Serve warm with a little heavy cream, whipped topping, or a scoop of vanilla ice cream.